After years of record profit growth, tech giant Samsung Electronics looks to be at a commercial crossroads as it searches for a new growth driver to counter slowing sales of its phenomenally successful smartphones. 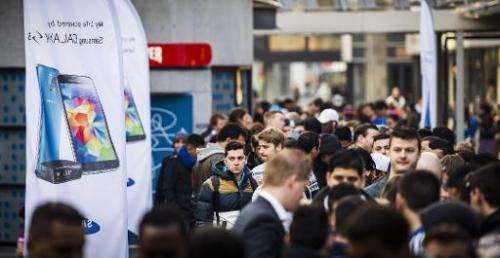 Alarm bells have been sounding for a while over Samsung's reliance on smartphone sales in increasingly mature markets such as Europe and the United States, and increasingly competitive emerging markets like China. The world's largest smartphone maker has a diverse product line ranging from memory chips to home appliances, but more than half its profits are generated by mobile devices. Last week, Samsung said it was on track for a second consecutive quarter of year-on-year profit decline, and its stock price fell nearly 10 percent in 2013—the first annual drop in five years. 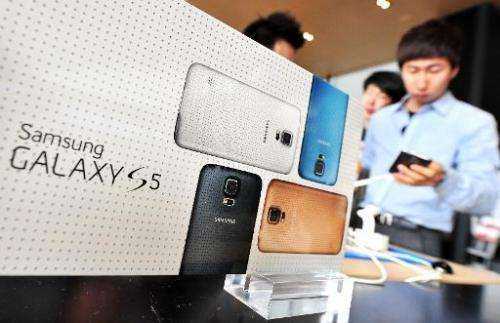 Friday saw the global roll-out of the latest version of the flagship Galaxy series smartphone, the S5, whose performance will be closely watched. While reviews have rated the S5 a top-class product, they note that it offers little in the way of real innovation that would set it apart from previous versions and models offered by competitors such as Apple. "I think the market really needs a new growth driver at this point," said Lee Min-Hee, an analyst at IM Investment and Securities, noting that the high-end smartphone market "is already saturated". "So it's inevitable to shift to mid-and low-end markets where margins are tighter and competition is even more fierce," he said. "Samsung did well this year on cutting costs—including marketing spending, but these are only defensive measures to make up for slowing sales and to maintain profits, not a proactive move to innovate." Lee noted that Samsung and South Korea's other export powerhouses are also feeling some strain from the strength of the won currency, which last week hit its highest point against the dollar since August 2008. Samsung said sharp currency swings cost it 700 billion won ($676 million) of lost revenue in the fourth quarter of 2013, when its operating profit came to 8.3 trillion won—a 6.0 percent decline on the previous year. And there appears to be a general consensus that smartphone evolution has hit a barrier that will only allow incremental improvements on existing design and technology, rather than market-changing re-invention. Many see wearable devices—such as Google Glass—as the "next big thing". IT research and advisory specialists Gartner Inc. predicts wearable technology will emerge as a $10 billion dollar industry by as early as 2016. Samsung's first Internet-enabled smartwatch, introduced last September, was given a lukewarm reception by consumers who disliked its chunky design. 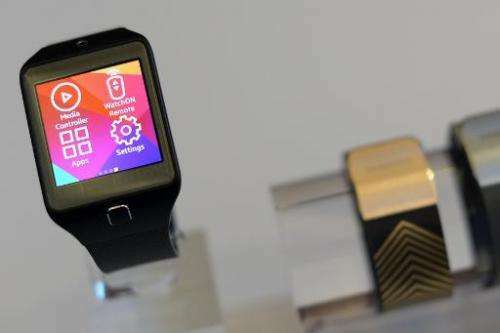 A second edition, the Gear 2, was launched in February. "I believe the next big thing will be Internet of Things (IOT) in which all household appliances, electronic devices and even cars are connected through the network," said Lee. "And the first step towards the era of the IOT is wearable devices," he added. Samsung Electronics certainly has the financial clout to invest heavily in new technologies with a net cash balance of more than $50 billion. At a rare analysts' briefing in November last year, president and chief financial officer Lee Sang-Hoon said the reserves would be used to fund significant investment in research and development. "It's way too much of an exaggeration to say it's all downhill from here," said Suh Won-Seok, an analyst at Korea Investment and Securities. "Given its economies of scale and relations with mobile carriers around the world, I believe it can maintain the 10 percent margin it needs to prevent any dramatic profit decline," he said. 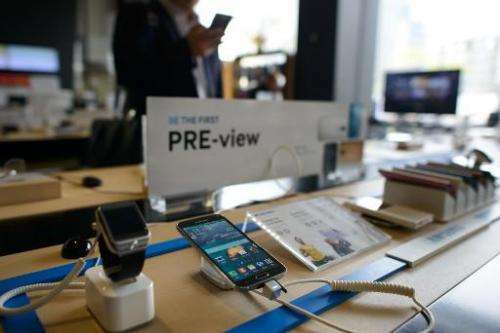 Samsung is already making margin concessions with the S5, launching it at a slightly lower price than its predecessor the S4 and throwing in a premium software bundle estimated at more than $500. Nevertheless, Greg Roh at HMC Investment and Securities said they had had cut their forecast for Galaxy S5 shipments for the year to 44 million, from the previous estimate of 46 million. "We also slashed our forecast for Samsung's second-quarter sales and operating profits by 1.5 percent and 2.7 percent, respectively," Roh said. "It's true that Samsung is good at producing profits despite slowing smartphone growth, but for now it looks inevitable that the operating profit falls this year," he added. Adding to Samsung's headaches is a continuing series of patent-focused legal battles with arch-rival Apple. A fresh trial opened in the United States earlier this month, with Apple vowing to prove that Samsung flagrantly copied iPhone features and should pay more than $2 billion in damages. The first step is good connectivity, although they do seem to understand that in South Korea. Understand it better than the U.S.